‘Tis the season for pumpkin, and we just can’t get enough. We add it to Gouda along with a dash of nutmeg and cayenne pepper to create a savory pasta dish. We combine it with whipped cream and layer it with gingerbread for a festive trifle. We even brew it with malts and hops and sip it alongside one of our favorite fall soups. 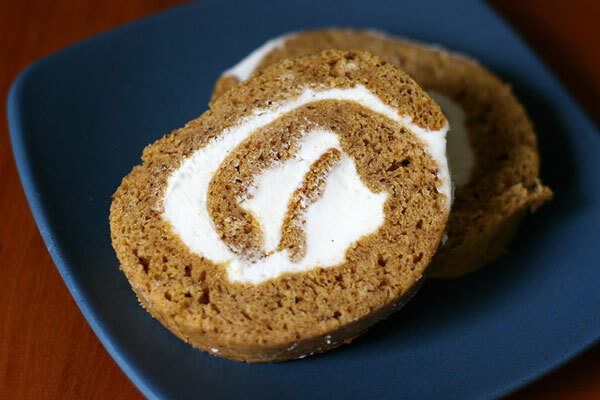 But perhaps one of the most classic uses for pumpkin is combined with cinnamon and cloves, baked, then rolled around sweet cream cheese. Simple to make and impossible to resist. Preheat oven to 375°F. Grease 15 x 10-inch jelly-roll pan, then line with wax paper. Grease and flour paper. And sprinkle kitchen towel with powdered sugar. Combine flour, baking powder, baking soda, cinnamon, cloves, and salt in small bowl. Beat eggs and sugar in large bowl until thick. Beat in pumpkin. Stir in flour mixture. Spread evenly into prepared pan. Bake 13 to 15 minutes or until top of cake springs back when touched. Immediately loosen and turn cake onto prepared towel. Carefully peel off paper. Roll up cake and towel together, starting with narrow end. Cool on wire rack. Beat cream cheese, powdered sugar, butter, and vanilla extract in small bowl until smooth. Carefully unroll cake; remove towel. Spread cream cheese mixture over cake. Reroll cake. Wrap in plastic wrap and refrigerate at least 1 hour. Sprinkle with powdered sugar before serving. – Pumpkin chili. Look up recipes on Google. The pumpkin puree gives the chili a hint of flavor and a very nice texture. It’s outstanding. – Pumpkin soup – very simple to make. I like to make it with Hog’s Galore bacon crumbled in it, but you can certainly do a vegetarian version. looks good! I can’t get enough pumpkin either! It’s not Thanksgiving without the pumpkin roll! Its our family’s favorite. I finally got smart last year and made two so that there would be leftovers to enjoy with our turkey sandwiches. Is Sam excited for his first Turkey Day?